This scarf is the softest thing I own and I am, more often than not, wrapped up in it’s cozy warmth. I made one for Chloe’s birthday a number of years ago and borrowed it so often that she decided to return the favor (or get her scarf back) and made one for me in the same yarn. This is actually called a woobie, and the name is accurate. Malou Woobie is made with Malou bulky alpaca from Lang Yarn in 0025 navy. Recently, we posted on the Riggin blog, yes, hey, there’s a Riggin blog! Yes, we posted on the Riggin blog about my winter projects. While Jon gets to work with wood and metal, I get to work with food and fabric. Usually I vacillate between knitting and food, but this winter fabric has taken my fancy. And then I found a new love – an industrial machine. My goodness these things are handy! A long time friend, who has been doing the canvas work for the Riggin since the beginning of our ownership has always offered that I use her machines to make hand bags or some other fun project. That’s not out of the question, but we had some things around the house that were needing some attention, so I approached her about her mentoring on something a little more complicated than bags. She’s a peach and was game. The slipcovers for our house settee were the first project. I loved that so much, a slipcover for a chair upstairs was next. Then I sewed a couple of things for the boat before I got back to pillow covers. Hopefully, I will have time to do another slipcover for the office chair before the winter is out and the garden takes all of my attention. Here’s a look at a few of the things I’ve been working on for the house. Banding for the house settee. The fabric is a linen poly blend. The settee covers installed and being used! Apparently, I needed the whole shop – slipcover in the front, engine cover in the back, pillows to the right. Cutting fabric for the pillows. Chair before and after. I’m so pleased with the new look! Each day I like to wear something hand made. Most of the time it’s something knitted, but every once in a while a sewn item creeps in to my wardrobe as well. There’s something deeply satisfying about moving through the day with something created by and/or for yourself. Something primal? Perhaps. Or maybe I don’t need to wax on about it, but instead need to say that I just truly enjoy it. You get it, right? After coveting a guest’s shawls for several years, I began to make my own luscious knitwear to envelop myself on those brisk sailing days (or really any evening on the Maine coast). My first was Authenticity by Sylvia McFadden and from that moment I fell head over heels in love with shawls. My second shawl was Silverleaf by Lisa Hannes made with Madelinetosh Pashmina in Glazed Pecan. It’s yummy. I need not say more. The yarn color is actually discontinued, I’m told, and it came to me by way of a fortuitous trade with a guest (on a knitting cruise of course) who knew my color wheel exactly. If you read last Friday’s post, then you know that somewhere in there, Chloe had to have a handmade knit item from me as well. Don’t worry, fair is fair, and hers came in the middle of the two sets of socks knit for Ella. Chloe’s hat, called the Baa-ble Hat because it has the most adorable sheep on it, was made with Quince and Co yarn purchased at our LYS, Over the Rainbow Yarn. 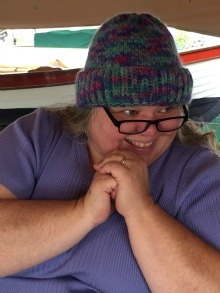 Mim Bird, proprietor and knitter extraordinaire, is also the instructor of our June 8-11, Sheep to Shawl Maine Knitting Cruise, where we’ll get to see yarn from beginning to end. Beginning at Bittersweet Heritage Farm, we’ll see sheep shorn (That was fun to write!). We’ll then gather back at the Riggin for 4 days of spinning with Heather Kinne of Highland Handmades and knitting with Mim of the above-mentioned Over the Rainbow Yarn. Back to the hat at hand, this super fun pattern was made with Quince and Co colors – Birds Egg; Split Pea; and Bark. (The white we already had on hand.) The pattern calls for the sheep feet and noses to be black, but we found that color to be way too stark with the rest of the palette. Even though the pattern is actually, at times, a four-color pattern, I found it to be really easy and approachable. As every good mama should, I alternate between making something for one and then the other. This project is one for Ella and one that was a joy to do – in part because she chose carefully – the pattern, the yarn, and the size – which meant that she was happy with the end result. It’s been a while since I’ve made things for the girls as there was a long time when anything I made was too itchy, too big, too small, too something. So there my loving, homemade, hard work would sit. In the drawer. Eventually to be out grown. So I stopped making things for the girls. Until one day last summer, Ella ASKED me to make some socks for her. I did so with a little trepidation, but also with a good measure of letting-it-go. I told myself that making a gift is not about how someone receives it (although it sure does help) but that instead it’s about the person doing the making. How it’s made, the care you give it, the thoughts while you create with fiber. This is what I told myself and mostly it worked. These are the first pair of socks after a long, gift-making hiatus. Made with sock yarn purchased at Over the Rainbow Yarn, our LYS and also sponsor/instructor of our June 8-11, Sheep to Shawl, Maine Knitting Cruise. Go Mim! This next gift was made with Berroco Vintage DK, Black Current #2182. I adjusted the Purl Soho Stirrup Sock Pattern to accommodate the yarn and Ella’s thinner-than-adult legs. I knit really loosely, so typically I have to go down 2 needle sizes to get the correct gauge. Knitting with size 2 needles, I cast on 68 stitches rather than the 96 the pattern calls for. I then adjusted accordingly, wrote down what I did (key to success here, right? ), and did the same on the other sock. Just wove the ends in yesterday! Wahoo! We are sailing away to knit and laugh together and you should come! Heather Kinne of Highland Handmades and I already got a good start on the laughing part when we filmed The Fiberista Files podcast together recently. Hanging out on deck and knitting. Let’s retreat together! Highland Handmade yarn by the fabulous Heather Kinne. The Knitting Getaway is 4 days and 4 nights of a fiber experience with Mim Bird of Over the Rainbow Yarn (Rockland Maine’s LYS), Dyan Redick of Bittersweet Heritage Farm, and Heather Monroe Kinne of Highland Handmades as we follow the start-to-finish yarn process of shearing to spinning to knitting with handspun yarn. We begin with a sheep shearing and skirting demonstration at Bittersweet Heritage Farm and wind up back at the Riggin for dinner at anchor. Heather from Highland Handmades will also be joining the trip to lead a spinning demonstration where you’ll be able to spin your own fiber (roving and combtop provided) on a drop spindle. Mim Bird will be with us as well to help assess the yarn we’ve created and figure out how and what to knit with it. Your yarn and your project will be individual… and as relaxing or as type-A as you’d like. This is a pretty special trip and all of the details are on the Riggin site. Check out The Fiberista Files podcast with Heather and me! The knitting cruise part starts around 22:30. Now that we are home and have all of our crafting tools at our disposal, the sewing machine has come out and the knitting needles have slowed (not stopped, just slowed). Of course there are tons of clothing items that one can make with re-purposed wool and wool sweaters, some of which I’ve shared in the form of fingerless mittens, cowl, and felt-decorated sweaters. Last week I came home from a school event and shared with Chloe the idea of a snappy wool skirt a student was wearing over leggings – cool boots too, of course. As I worked my way through the crowd and closer to the skirt (the student I mean), I realized that it was actually the bottom of a felted sweater inverted so that the hem or lower cuff of the sweater had become the waist band of the skirt. The next morning Chloe comes down wearing one of two skirts that used to be wool sweaters hanging out in the crafting pile ready and waiting to become something. The second was prepped for a short spin under the sewing machine. Felt the sweater so that the fibers connect and the ends don’t fray by washing in hot and rinsing in cold water. Stop the washing machine occasionally and check to be sure that you aren’t felting it more than you want. The fabric will just become thicker and thicker with changes in temperature and agitation so slower is better. When the fabric of the wool is the thickness that you’d like, spin it to wring out most of the moisture and then hang or lay flat to dry. Sometime I’ll roll an item between two bath towels and then press or even step on the roll to squeeze out any excess moisture. To determine the length of the skirt, measure vertically from where it will ride – waist, belly button or below belly button – to where you’d like for it to end – knee, thigh, mid-thigh. There is no hemming necessary with this project, so therefore no need to adjust the measurement for hemline material. When dry, lay the sweater out on a cutting board. With a yard stick or measuring tape, measure from the bottom of the sweater (waist of the skirt) to the hem of the skirt. Make a horizontal, straight cut across. Note: If the wool is the washable sort, then a quick zigzag stitch along the hemline takes care of any unraveling that might occur. It also can add a design element if you use a contrasting thread color.